How can a tall 6'3 man fit into an s1 1977 esprit?! 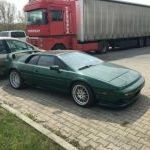 Alas I am too tall to fit into a Lotus Esprit s1 - has anyone any tips or advice short of waiting until I am 70?! You can remove the seat adjustment runners. I would for other models say swap the seats, but an S1 should have the original look and that includes seats, so Elise seats or such like are out. If you speak to Nick Fulcher (coach trimmer, ex of Lotus Trim shop who designed the very seats we are talking about) he may have some methods that could be employed. The biggest difference is from opting for a smaller wheel so you can get uour legs round easily. I'm 6'1" two inches shorter but I've not had to change my seat. or remove the runners as per the LEW advice. I'm 6'1 as well and thought I'd lack room before I bought my S1...well at my great surprise I have to move the seat forward to drive the car. There is a lot of room in a S1, it's very confortable. For a 6'3 person a smaller steering wheel seems like a good solution, indeed. bit late but...I'm 6'2 and long in the leg, I fight fine. If you also have long legs then a smaller steering wheel is a must. I tried the stock wheel but it was uncomfortable. Fortunately the car came with both stock and a spare from a stevens. Not tried removing the seat runners. Thanks - any advice on a good "smaller" steering wheel that looks close to the original as poss? I put an S3 one into mine, it's original Lotus, just a bit newer. I keep the original though. Perhaps for a special occasion, when it needs to be 100% original. I've had standard 13" Momo steering wheels on a couple of mine (the white one currenty), and they don't look out of place. My blue one has the original wheel, and it sometimes gets in the way, but it doesn't bother me. I am 6' 2.5" and fit very comfortably in an S1 with the seat runners in place. I'm 6ft. 5.5 in (197 cms) and drive an S3. I found that if you remove the seat runners you get typicall an inch more headroom. To increase legroom I have installed an Elise S1 seat. Instead of a smaller steering wheel, I'm considering using a spacer. Like the ones you see WRC cars use. Should bring the wheel a little close and make i possible for me to get my leg under the steering wheel properly. Do remember that having a steering wheel that is too small could be a problem since there is no power steering. I have a 1990 SE and am 6'2". I have a small Momo wheel fitted, but without power steering it is hard work at low speed. I do have the original wheel, but it's just too tight against my left leg to be comfortable. I would be interested in trying a longer boss, but where to get one? Any ideas/contacts? Good man, you'll also be surprised to hear that there's another Turbo SE in Folkstone! Where are you having the car worked on? Car is still in the de-snagging warranty phase, and it's going back to UK Sportscars in Wingham. I haven't seen the other Turbo SE around; whose is it? you'll also be surprised to hear that there's another Turbo SE in Folkstone! I haven't seen the other Turbo SE around; whose is it? I guess the regulars on this board are sick by now of these "will I fit?" topics, so I figured I'd bump this one. I'm 6'5", very slim, size 10,5 shoe (so at least no big fat legs to squeeze under the dash ) and was wondering if there's any chance of me fitting in an S3 with factory glass roof, I've been looking at these figuring the absence of a headliner would give a bit more clearance. I already found the "Tall Drivers" URL mentioned in this topic, but would like to get an idea if changing the seat would be a necessity for me. I was hoping I'd manage by tilting the seat back with some spacers and possibly adding a steering wheel hub extender moving the steering wheel a bit closer to the driver. Would I still need to remove the rails for more head clearance? 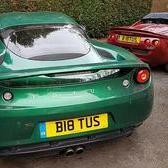 And worst case scenario, what would a pair of Elise S1 or Esprit GT3 buckets cost me in the UK and how much leg room is to be gained this way? Best plan would be to try and see if you fit. Have you had a seat in a car? I'm afraid not, the S3 Esprit is a VERY rare beast over here (Belgium). Not that it'd matter much, I'm quite sure that fitting into an unmodified example would be my worst nightmare (and my chiropractor's dream ) , which will be the case for practically all cars for sale. It'd be nice to have some idea how much legroom is to be gained and how, I'm assuming sellers will mind if a potential buyer asks if he can rip out the seat. size 11 (46) shoes, but best to use racing boots/shoes as thiner so less chance of hitting the wrong pedal, does happen occasionally. my turbo hc as rake seats which helps alot but I have driven the earlier turbos, not problem in the S4S as more room all round. Haha, might be a problem. You should get in touch with Simon350s on here. He's a tall 'unit' and has an S3 that he fits into with Elise seats, not sure how they're attached to the car though. Greetings, my fellow vertically challenged friend. Regarding driving an S3 Turbo with stock seats, was this at all doable (besides looking rather comical I suppose) or would you consider driving with stock seats as a longterm solution pretty much impossible? I'll shoot a PM to Simon350s as well. Thanks for the (fast!) replies so far, this forum is working out better than I expected. To be honest I don't know a whole lot about these Lotuses, I'm just a fan of wedgeshape 70's Giugiaro design, my daily driver is an Alfa Romeo GTV6. Next step will be to find a car in my neighbourhood with an owner that will let me try and squeeze into it.